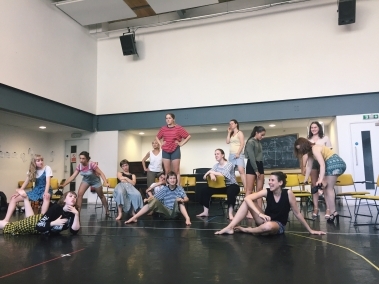 Whilst Associate Director Maisie Newman is busy in intensive week for Make More Noise, Assistant Director Nell O'Hara takes the blog reigns to give us a lowdown on how things are hotting up in the penultimate week of rehearsals. So we’ve hit intensive rehearsals (eek!). One more week before we go into production and the entire cast and creative team are working day and night to get the show ready. Lisa (the show’s director) and Maisie (associate director) are steering the ship with a calm, but very focused attitude. And if we weren’t warm enough in this weather we decided to spend the morning going through all of the movement in the show. Two fans at full pelt made little difference to the soaring temperature as we melted in puddles onto the rehearsal room floor. Nevertheless, the sweaty work paid off as the movement feels more cohesive now and integrated into the entire show. The cast have been rehearsing the movement in high heels, which has been an extra challenge - Maisie and I both donned a pair to show support and find out just how hard it would be to move in heels. I’m afraid I gave up after a while as it proved very difficult... I don’t know how Beyoncé does it, props to her! It’s been exciting seeing all of the movement coming together with the beautiful original music composed by our musical director Alexi. It’s brought another layer and added a heightened quality to the work and I’ve loved seeing how it galvanises everything together. Everyone now has a first draft of the script and we’ve been working from it scene by scene. Because this is a devised show, the script has emerged during the rehearsal process and it feels incredible to have a concrete document that has been made collaboratively. However even now things are still changing and we are scribbling away in our scripts to update it. Having a script has given us a better idea of the show and what it looks like so far. Whilst working on it we can look at it and say “right that works” or “oh I think that would be better there”. We’ve been going through things in a lot of detail and honing and tweaking, making sure the structure works and that it makes sense. It’s fun getting to this stage of the process because we can begin to see what our show looks like and the potential of what it might be - and I think it’s going to be great. We are doing a run tomorrow morning from start to finish which is very exciting. It may be slightly staggered but I think it will get everyone pumped for next week. It’s definitely crunch time in the rehearsal room and we are raring to get our work in front of an audience. But there are still adjustments to be made and every second we have left will be filled with making this show as good as it can be. All of these amazing women’s voices are ready to be heard and we can’t wait for you to hear them. We’ll be going into tech next week to put the final bit of life into this piece ready for our audience on Thursday evening. We hope you can join us!